Cherry Hill Police Chief Bud Monaghan, Capt. Amy Winters, and Sgt. Ed Walto accepted the JFCS Community Partner Award on Tuesday night. Congratulations to the Cherry Hill Police Department, which received the Community Partner Award on Tuesday evening at the Samost Jewish Family and Children’s Services’ 72nd annual meeting. The Department was cited for its numerous efforts to work proactively with groups in our community, including JFCS, with particular emphasis on the Department’s ongoing partnership in the Right In Our Backyard presentation designed to educate and prevent opiate abuse in our community. Chief Bud Monaghan, Captain Amy Winters and Sgt. Ed Walto were in attendance at Tuesday’s meeting to accept the award. Winters and Walto have been instrumental in the creation and success of the In Our Backyard Program. Please join me in congratulating our police department, and in thanking them for all that they do to make Cherry Hill a better, healthier and safer place for all of us. Registration is now open for upcoming classes and programs offered through the Township's Recreation Department. This year's programs include the popular Morning Fun summer camp, and the Co-Ed Recreation Basketball program. As you look to register for this season's classes, be sure to explore CommunityPass, our new online registration portal, which will make it easier to enroll in upcoming classes and programs and buy event tickets. Users can create family profiles, register for programs and buy event tickets - and CommunityPass makes it easier for Township staff and class instructors to communicate with participants. Visit the CommunityPass website today to explore our Summer program and class offerings, and for a full list of upcoming events. Please note: Those looking to register for the Morning Fun program should seach under Spring 2016 events. To view an interactive copy of the Community Magazine click here. For more information, contact the Recreation Department at (856) 488-7868, or e-mail Recreation@chtownship.com. Look for this logo to identify programs and services that are part of CHIP. Cherry Hill recently launched an exciting new initiative that makes accessing information and services easier and more convenient than ever before. CHIP -- which stands for the Cherry Hill Information Portal -- consolidates all of the Township's existing online services into one easy-to-find location, accessible 24/7 on any computer, tablet or other mobile device. My goal as Mayor is to run Cherry Hill efficiently and effectively - and to make it as easy as possible to find the information you need. CHIP takes us one step closer to that goal. Think of it as your own personal "key" to Town Hall! From permits and inspections, to tax information, Recreation registration, interactive maps and reporting concerns, residents and businesses alike will find all of this and much more right on our CHIP page. Look for the red CHIP logo to the right of this message to identify services as part of CHIP, and visit www.CherryHill-NJ.com/CHIP today to explore the portal, and find out how it can work for you. And stay tuned as we bring additional programs and services online in the coming months! Road work will continue across Cherry Hill next week, with milling and repaving continuing on a number of roads, including Fairfax, Waverly, Massachusetts and New York avenues. Concrete work and sewer repairs will continue on King George Road between Chapel Avenue and Cornwall Road, as well. All work is being done by the Township's Department of Engineering, as part of the Township's 2015 Road Maintenance Program. Work on all roads will include road resurfacing, as well as isolated sidewalk and curb replacement where necessary. School bus schedules and trash pick-up will not be affected by this work; however, our contractor will notify residents in the event parking is limited by construction. All work is weather-permitting; residents with questions or concerns can contact the Department of Engineering at (856) 424-3203. My administration and Town Council continue to prudently invest in our town's infrastructure, and are continually working to ensure that our roads are smooth and safe for travel. Click here to learn more about our Road Maintenance Program. 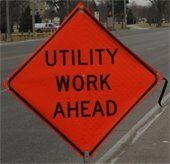 PSE&G gas line work is expected to continue through May 20. Delays are expected again next week on Haddonfield-Berlin Road between Brace Road and the I-295 interchange, as PSE&G continues underground gas line repairs. Traffic on Haddonfield-Berlin Road will be restricted to one lane in each direction, with work remaining in place 24 hours a day through Friday, May 20. Motorists should plan to take an alternate route, if possible, and expect congestion and delays, particularly during peak travel times. As always, please use caution when traveling through any work zone. Police will be on scene for the duration of the project to ensure the safety of both workers on-site and passing motorists. Thank you in advance for your cooperation. Captain Amy Winters speaking to residents about the dangers of narcotics in the community. The Cherry Hill Alliance on Drug and Alcohol Abuse and the Cherry Hill Police Department collected more than 12 pounds of unused and unwanted prescription medications last Saturday, during our May 9 Spring Clean Up and Pill Drop Off Event for seniors at the Carman Tilelli Community Center. The event, aimed at educating the public about prescription drug abuse, included a presentation from Capt. Amy Winters, who detailed the dangers associated with illegal narcotic pill use and the current state of the opiate epidemic within our community and throughout South Jersey. In addition, Officers Renee Houlihan and Jim Philbin discussed a number of scams currently targeting the senior community. If you couldn't attend last week's Pill Drop-Off, but would like to safely dispose of your own medication, you can access the Project Medicine Drop Box, located in the lobby of Police Headquarters (820 Mercer St.), 24 hours a day, 7 days a week. Medication can be dropped off anonymously and free of charge. For more information about Project Medicine Drop, click here. 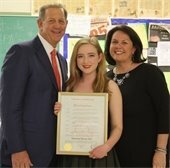 Mayor Cahn and Council Vice President Sara Lipsett present a proclamation to Cherry Hill East Senior Madeline Bowne. Council Vice President Sara Lipsett and I joined the Cherry Hill Public Schools and the staff and administration at Cherry Hill East last week to honor Senior Madeline Bowne for her winning entry in this year's C-SPAN's StudentCam video documentary competition. Madeline, who has submitted a winning entry in the competition every year since 7th grade, was selected as a second-place winner from among more than 2,800 submissions from 6,000 students in 45 states. Her documentary, "When the House Becomes a Home," examines Congressional term limits, the role of corporate financing in political campaigns, and the impact long-term office holding has on governmental effectiveness. Madeline is a bright young student who plans to attend Rutgers University in the fall. Please join me in congratulating her on an impressive documentary that explored a very relevant and interesting topic. Click here to watch "When the House Becomes a Home," and please join me in wishing Madeline all the best in the future! Features original two-dimensional works in watercolor, pastels, oils and more. All artwork is available for sale. Artists will be on hand to meet and discuss their work. Artist awards will be given and light refreshments will be served. The gallery is open with varied hours from May 16-19 and May 22-25. Join us as we welcome back members of the Ocean City Pops, led by OC Pops Music Director William Scheible, for afternoon of Broadway's best tunes, from shows such as Aladdin, Beautiful, Fiddler on the Roof, Chicago, Jersey Boys and On Your Feet. Tickets are $15, for the general public; $12 with a gold card; $5 for students. Enjoy a filmed concert of Barbra Streisand. Lunch will be served during intermission. Attendees can also view the Art Blooms Juried Art Exhibit on display in the Arts Center. Tickets are $5 in advance/$8 at the door. For more information about Art Blooms and for other upcoming cultural events, visit http://cherryhillarts.blogspot.com, call (856) 488-7868 or e-mail Arts@chtownship.com. Cherry Hill Township will celebrate National Kids to Parks Day in local parks across town later this month. On Saturday, May 21, visitors to select playgrounds will receive a free ice cream cone courtesy of the Cherry Hill Recreation Department and Mr. Softee. A list of parks and times will not be released until closer to the event -- and will only be found on the Recreation Department's social media sites! Follow @CHT_Rec on Twitter, @cherryhillrecreation on Instagram and the Cherry Hill Recreation Department on Facebook, and be sure to keep an eye out for details! Kids to Parks day is a nationwide effort to encourage children and families to explore their neighborhood parks and discover science, history, nature and adventure right around the corner - and with more than 50 local parks in our community, Cherry Hill is the perfect place to celebrate the occasion. We hope to see you around town on May 21! The Cherry Hill Fire Department will be offering a Safe Babysitting Class to Cherry Hill residents ages 13 to 16, from 9 a.m. to noon on Saturday, June 18, at the Marlkress Road Fire Station. Registration is required no later than June 16; class size is limited to 25 students. If you have any questions please contact Tammy DeLucca at 856-795-9508, ext. 1333 or e-mail tdelucca@chfd.org. Stephen Ritz will speak from 6:30 - 8:30 p.m., Thursday, May 26 at the Marian House on Kings Highway. Come learn and grow with Sustainable Cherry Hill at a special evening with the inspiring Stephen Ritz, award-winning educator and urban farmer from the South Bronx. Stephen transforms lives and cultivates a love of learning by using "growing gardens" in schools to engage and educate students about food sources, healthy diet, nutrition, and business. A 2016 top ten finalist for Global Teachers Award, and one of National Public Radio’s top 50 teachers, Stephen has been a guest speaker internationally from the White House to the Vatican. This event is open to the South Jersey community. Seats are filling up! Register today at www.sustainablecherryhill.org. Event is free, donations welcome – partial proceeds to benefit Green Bronx Machine. Limited cash bar & healthy snacks available. This event is part of the year-long Food Day 2016 celebration. The J.F. Cooper Elementary School PTA invites the community to its annual family fun carnival, from noon to 4 p.m. Saturday, May 14, at the school's playground. Join more than 1,000 local residents for a child-friendly afternoon featuring inflatable slides, a rock wall, moon bounce, games galore, art opportunities and food from Mr. Softee, Chick-Fil-A and more. There will be dozens of raffle baskets featuring free weeks of summer camp, gift cards from area restaurants and free birthday parties! Grand prizes include free swim club membership! Cooper School is located at 1960 Greentree Road. For more information about the carnival, click here or call (856) 424-4554. Samost Jewish Family and Children's Services will host a free campus sexual assault awareness and prevention seminar for college-aged children and their parents at 7 p.m. Tuesday, May 24, at the Katz JCC. A panel of experts and representatives from local schools will be participating. Students will learn to Avoid Potentially Risky Situations, Understand The Laws of Consent, Know Their Rights and Resources, Carry Out Meaningful Bystander Intervention and Learn to Stay Safe Using Current Technology. The seminar is free; register at www.jfcssnj.org/protectu. For questions, please e-mail Hilary Platt. The Garden State Wine Growers Association joins us for a look at the history of the New Jersey wine industry from colonial days to prohibition and its rapid growth over the past decade. We’ll also examine the types of grapes grown in the state and why our region is great for growing grapes, making NJ the seventh largest wine producing state in the country. A local winery representative will discuss the quality of New Jersey’s award-winning wine and explore the various wine trails throughout the state. Click here to register. Michael Osacky, a certified vintage sportscard and memorabilia appraiser, will present on sports memorabilia and the hobby of collecting. Attendees are invited to bring their vintage sports collectibles (1970 or earlier) and after his talk, he will provide free verbal appraisals as time allows. Click here to register. Cherry Hill is a wonderful place to live for residents 55 and older. The Township provides a variety of programs and services for seniors of all ages and interests. Below are a few free upcoming activities; for a complete list of programs and events, view the Cherry Hill Township Community Magazine online, or visit CommunityPass, the Township's new Recreation Registration site. Senior Walks: 9:30 a.m. Monday; 6 p.m. Wednesday, Croft Farm, 100 Bortons Mill Road. Join other area seniors for a brisk walk along the beautiful Croft Farm trails. Dress comfortably, with shoes appropriate for walking or hiking. Water and insect repellent recommended. Walks leave promptly at 9:30 and 6. Line Dancing: 10:30 a.m. Thursday, Carman Tilelli Community Center, 820 Mercer St. Register through CommunityPass. Ceramics: Noon Thursdays, Carman Tilelli Community Center. Register through CommunityPass. Senior services are one of the most important services we provide as a Township. For more information, or to inquire about an issue related to our 55-and-older community, please contact Senior Services Coordinator Gaye Pino at (856) 661-4800/gpino@chtownship.com, or our Recreation Department at (856) 488-7868/Recreation@chtownship.com.